A native of Holland, Ron Baggerman is one of Europe's most active Stick players and has the credentials to prove it. As a twenty year veteran of the Stick, Ron has studied with Emmett Chapman and has had countless students of his own all over Europe. In addition to his performing and teaching, Ron has also proven to be a gifted composer. He debuted his work in recorded form on his 1999 CD release Galaxy Gypsy. 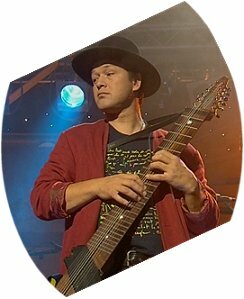 In 2002, Ron has given us a "double dose" of newly released material with his latest CD The Seven Sisters as well as a new live concert video Live In Concert featuring Ron on Grand Stick and Jan Wolfkamp on Drums and loops. You can catch Ron performing regularly in Cannes, France and you can also catch him performing in Barcelona this June. Also coming up in June, Ron will be teaching at the 1st Stick Center European Seminar in Spain along with Stick player and Stick Center founder Guillermo Cides. For more details on upcoming performances, visit our events calendar.